In case you thought anyone was actually paying attention when professional conferences are scheduled in places like Orlando..
CAMBRIDGE, Massachusetts (Reuters) — In a victory for pranksters at the Massachusetts Institute of Technology, a bunch of computer-generated gibberish masquerading as an academic paper has been accepted at a scientific conference. Jeremy Stribling said Thursday that he and two fellow MIT graduate students questioned the standards of some academic conferences, so they wrote a computer program to generate research papers complete with “context-free grammar,” charts and diagrams. The trio submitted two of the randomly assembled papers to the World Multi-Conference on Systemics, Cybernetics and Informatics (WMSCI), scheduled to be held July 10-13 in Orlando, Florida. The unanswered question is whether they could they turn in the Rooter paper for a class and get something besides an F? Here’s a PDF version of another great paper submitted to the WMSCI conference. 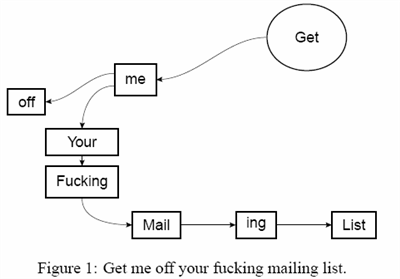 I’ve excerpted my favorite part of the paper below, the powerfully convincing Figure 1. When I read this article earlier, I died laughing. The guy’s web site is a must-read. They have the correspondence involved included and some of it sounds like it was generated with the same program they are using. The decision tree at “me” is wrong. Maybe we can get one of the VP’s at Oracle to write a white paper on Rooter. I’m reminded of an anecdotal story of someone running a Jimmy Carter speech through some content-analysis software, which determined he’s said…nothing. I always found it funny that scientists and engineering academics put down the humanities as “softer” disciplines because of Alan Sokal’s 1996 fakery in Social Text. Now, we find that the folks in the “harder” discipline can be just as gullible. On behalf of the Organizing Committee, we would like to inform you that, up to the present, we have not received any reviews yet for you paper entitled: “Rooter: A Methodology for the Typical Unification of Access Points and Redundancy”. So, your paper has been accepted, as a non-reviewed paper, for presentation at the 9th World Multiconference on Systemics, Cybernetics and Informatics (WMSCI 2005) to be held in Orlando, USA, on July 10-13, 2005. We will inform you about the conference program, including your presentation, once the timetable is finalized. So this is not as bad as it might be had it been actually reviewed. Actually, the e-mail says that no one commented on it. When you look at some of the other documents, it appears that it did go out for review. In fact, when you read further into the events around it, it is clear that at least two people did pick up that it was gibberish and say something to the conference. Either the reviewer belw off the papers or didn’t realize they were bogus. I’m not sure if you’re disagreeing with me or not, Steve L. Yes, it seems people picked up on the problem after the paper was accepted, and after it was made public that the paper was a fake. The response from the conference’s organizers did suggest that one of the reviewers figured things out; but again, this was obviously after the paper had been accepted under “non-reviewed” status. I’ve looked at the original paper, and as someone with experience in academia who has reviewed papers for journals, I can totally imagine what happened. The fact is that few people like reviewing papers. So maybe the referees put the paper right on a stack and never got to it. Or maybe they tried to read the first couple of paragraphs, couldn’t make heads or tails of it, and tossed it aside figuring that they’d sort it out later, and never got back to it. I can tell you from personal experience that some technical papers take quite a bit of effort to actually digest. If I had trouble understanding what a paper was about right off the bat, I would not immediately assume it was randomly generated 🙁 On the contrary I would assume that the authors were lousy writers, but I’d resign myself to having to redouble my efforts to figure out what they’re trying to say. Not fun. In fact, I personally feel that it is much more difficult to review a paper that deserves rejection, because frankly you really have to justify your decision. If you read a paper that’s well done, and the results are sound, the review is short! But for a poor paper you have to figure out why it is bad. At first I found my sympathies lay with the conference organizers, with the SCIgen folks taking advantage of inevitable inefficiencies to pull a stupid prank. Well, now I am more open to the idea that they were trying to expose more long-standing negligence on the part of the conference organizers. I rarely know what they are talking about at technical conferences. Just sit there dumbly like everyone else waiting for the boredom to end. So I’m sure their presentation will be received in the usual manner, politely by blank-faces with a few rotten apples trying to impress everyone with their know-it-all questions at the end. Interesting: I received an email today that contained a very nasty (but common, unfortunately) worm/viral attachment that contains a subject header referencing a version of a “generator” of similar area interest. And employs a particularly unique expression I used on a comment in Wizbang yesterday. The development of SMPs is an extensive question. In this position paper, we verify the study of architecture, which embodies the robust principles of complexity theory. In this position paper, we verify that even though the famous pseudorandom algorithm for the visualization of consistent hashing by Bhabha runs in Q(logn) time, superblocks and digital-to-analog converters can agree to answer this grand challenge. One rarely knows what they’re talking about McCain, but you at least hope they show you some cool results at the end. I wish I could have gotten away with that idea after I made my 0.00 my last semester!… My grandfather got my grades! He called me to tell me that I didn’t do vey well this time… I had to say,” I know but I will do better next time!”… I certainly couldn’t have done any worse!… I was busy. Well guys .. i wudnt blame anyone..for all u know my paper was selected at two conferences. I think this is a chance for me to get enuff exposure.. I am goin to present my papers at both the conferences.. i dunt mind as long as these conferences help me in some way or the other..